China's beloved national symbol—the panda—may have been seen quite differently by ancient humans: as food. Scientist Wei Guangbiao says prehistoric man ate pandas in an area that is now part of the city of Chongqing in southwest China. Wei, head of the Institute of Three Gorges Paleoanthropology at a Chongqing museum, says many excavated panda fossils "showed that pandas were once slashed to death by man." The Chongqing Morning Post quoted him Friday as saying: "In primitive times, people wouldn't kill animals that were useless to them" and therefore the pandas must have been used as food. But he says pandas were much smaller then. 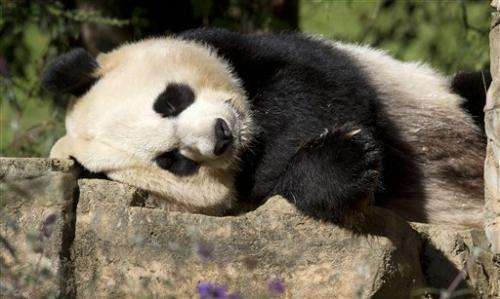 Wei says wild pandas lived in Chongqing's high mountains 10,000 to 1 million years ago. The Chinese government invests greatly in studying the native species and trying to ensure its survival. Pandas number about 1,600 in the wild, where they are critically endangered due to poaching and development. More than 300 live in captivity, mostly in China's breeding programs. 1. "In primitive times, people wouldn't kill animals that were useless to them and therefore the pandas must have been used as food." Besides being erroneous, this sounds like the fallacy that assumes that primitive humans lived in perfect harmony with nature. Ancient agricultural practices have been devastating to the environment (cf. Mayans, Pueblo) and even hunter-gatherers were not perfect (cf. North American practices of running buffalo off cliffs). 2. "many excavated panda fossils "showed that pandas were once slashed to death by man." Again, just because they show signs of slaughter by humans doesn't mean it's for food. Is food the only use humans have ever had for animals? Why not fur for warmth in the mountainous areas that they lived in? Or maybe these primitive groups saw a hostility in pandas, that they were some sort of evil spirit that must be killed? If they had found repetitive sharp incisions on the bones, appearing as sawing off the meat, then I might be more convinced.